For many medium- to large-size bearings in a number of demanding industries, remanufacturing can offer considerable benefits, including lower life-cycle costs and less unwanted downtime, especially if remanufacturing is combined with other SKF services and technologies. In addition, remanufacturing can support a company’s efforts in the growing importance of sustainability issues. SKF has always recognized the importance of remanufacturing for heavy industries such as metals, mining, mineral processing and cement, pulp and paper, and marine. SKF has a large number of centres around the world that can offer remanufacturing services and is dedicated to expanding with new service centres in the future. In many applications, bearing service life can be shorter than the calculated rating life. This is because damage to bearings can be caused by such factors as contaminants and sporadic metal-to-metal contact in the rolling contact area. Bearing remanufacturing continues to be an important service for many demanding industrial sectors. It can offer considerable operational cost reduction and energy savings in addition to contributing to reduced total life-cycle expenditure, thanks to longer bearing service life and machine uptime. large-size bearings with an outside diameter of 420 mm and above, backing bearings, caster bearings, such as spherical roller bearings and CARB bearings, slewing bearings. Fig. 1: Typical bearings suitable for remanufacture. Crucially, knowledge of both bearing manufacturing and the specificity of applications in which the bearing is used is important so that the right remanufacturing procedure can be applied. This ensures that the bearing is remanufactured in a manner that is compatible with the application’s requirements. An extensive analysis of bearing damage is carried out along with careful costing of the remanufacturing. This normally involves visual inspection to determine the type and depth of the damage and measurements that include clearance, ovality, and wall-thickness variation of the rings. Additional non-destructive tests can be carried out, depending on customers’ requests or bearing specifications. Customers are advised of the work to be carried out before a final order is made. Besides industrial bearings remanufacturing, SKF offers remanufacturing of bearings for the railway industry (wheel and axlebox bearings), machine tool spindle remanufacturing, gearbox remanufacturing and more. Fig. 2: SKF’s remanufacturing process. During remanufacturing, relevant functional surfaces are remanufactured (fig. 3) and bearing components replaced, if necessary. Consequently, the potential service life of the bearing can be extended. 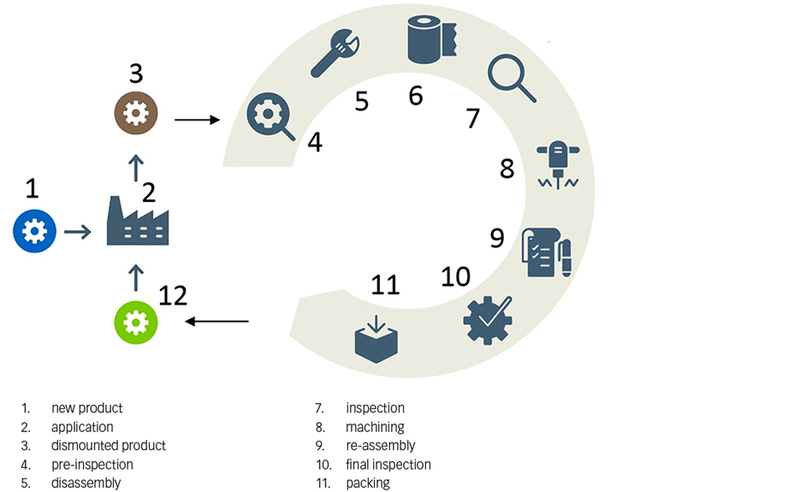 Depending on the bearing condition, remanufacturing can take from as little as a few hours to a number of days (fig. 4). Also, depending on the amount of remanufacturing required, as much as 90 percent less energy is needed to remanufacture a bearing compared with making a new one. Taking into consideration the bearing size, complexity, condition and price, substantial cost savings can be achieved by remanufacturing. SKF applies its latest bearing manufacturing standards, processes, equipment, quality assurance, knowledge and expertise as a foundation for its bearing remanufacturing services and applies it globally. Acceptance criteria are designed to deliver high-quality results whatever the extent of the remanufacturing carried out. Fig. 3: Large-size spherical roller bearing: before and after remanufacturing. As traceability is important, SKF employs an advanced management process to register all the data of each case and applies a unique code to each asset. In this way each bearing can be tracked through its future life cycle. During the process, SKF can also offer remanufacturing to include bearing feature modifications for different or higher specifications. This can include mounting sensors, providing integrated lubrication or offering different sealing and coating solutions. SKF’s remanufacturing process also takes into account the environment through responsible cleaning of used bearings and waste handling. Having undergone remanufacturing, SKF customers can avoid the recurrence of damage that required the remedial work by exploiting SKF’s predictive maintenance expertise. This provides information about the status of plant machinery through various monitoring services. In addition, SKF offers root-cause failure analysis that identifies those causes and effects that impact on bearing damage and produces a comprehensive plan of corrective action to avoid future problems. Fig. 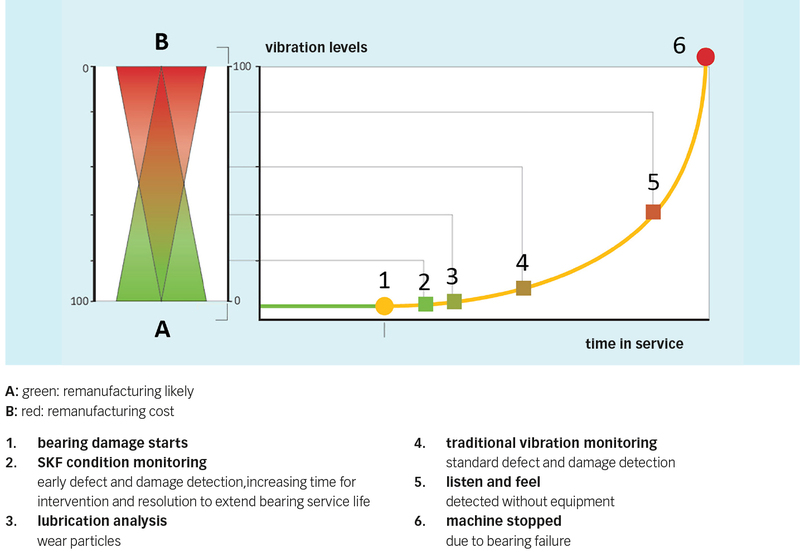 4: Remanufacturing costs – Damage severity versus remanufacturability – bearing damage detected at an earlier stage increases remanufacturing possibility and reduces related cost. 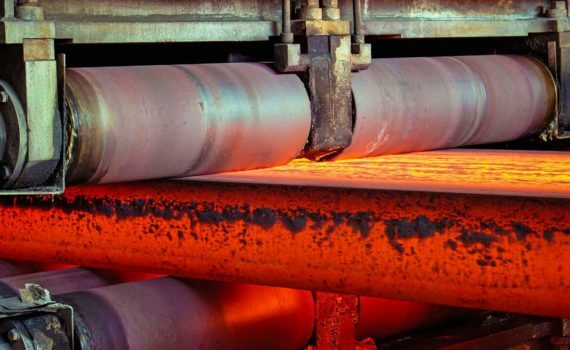 For many industrial applications, bearing failure impacts severely on operational costs. SKF has developed solutions to help reduce the total cost of ownership of rotating equipment. The SKF Rotation for Life programme is a long-term, performance-based contract based on a monthly fee. This integrates bearing technology, damage detection, reliability and remanufacturing services, which are part of SKF’s core expertise. Based on the real operating condition of the critical assets, SKF defines key performance indicators. These are used to support a reduction in a company’s total cost of ownership of those assets by offering a single source for components, expertise and services. Savings are made partly through increased machine availability and by cutting capital outlay through optimizing the spare parts inventory and minimizing waste. In conclusion, SKF can offer substantial benefits to end users including extended bearing service life and reduced machine downtime, resulting in lower total life-cycle costs, and less environmental impact. This is coupled with a maintained stock of replacement bearings and improved overall asset reliability. CARB is a registered trademark of the SKF Group.